We are glad to have you with us for our First Session - Are You Saving OR Are You Investing? Many people often misconstrue savings with investments. But let us tell you that there is indeed a difference between the two. Merely putting aside money under the mattress, or in a vault, bank locker or savings bank account after meeting your expenses and liabilities may not mean that money works for you. In times where the inflation bug is eating into your earnings, you need to move a step forward and invest. More importantly, invest wisely! By now many of you may have realized that there is indeed a difference between saving and investing. So let's delve a little deeper and understand the difference between the two...which can help us march forward in our journey of wealth creation. Now that we have seen the right approach to savings, the question is, can saving alone help you achieve your life's goals? - Which could be: buying your dream home, your dream car, your children's education, their marriage, your retirement; amongst a host of other ones. Do you know, over the years, the money that you have saved - kept aside in your vault, bank locker, savings account, or under the mattress - may lose value as the inflation bug eats into your savings if it is not allowed to grow at a decent pace? Therefore, in order for it to grow, you need to put your 'money saved' to productive use - and make money work for you! And what should you do to make money work for you? Well, the answer lies in INVESTING! Let us take an example of 3 friends - Vijay, Ajay and Sanjay - All 3 had good jobs and wanted to retire at the age of 60. 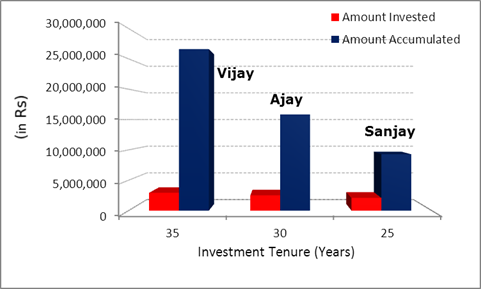 Vijay being the smarter of the lot, started planning for his retirement at the very initial stage, at 25, and invested Rs. 7,000 per month. Ajay realised the importance of planning for retirement once he was 30, while Sanjay could feel the guilt of being left out only when he was 35. See what they accumulated when they were on the verge of their retirement. Disclaimer: The names and figures are fictitious and used for example purpose only. Also, return per annum mentioned above is for illustration purpose only. Points to Remember for You to Save & Invest Wisely! This ratio simply tells you what part of your income you are saving annually. Higher the ratio, the better it is, as it facilitates you to invest and lets your money work for you. This ratio helps you understand the current value of investments done as a ratio of current income. At a younger age this ratio tends to be lower. However with time one needs to accumulate enough savings and invest to fulfil various financial goals in life. This ratio would help you evaluate the proportion of total debt as against the total annual income you earn. Lower the ratio, the better it is. Following these ratios, which you have just learned of, can help you keep a track of your finances.